The snake patio is not to be confused with the snake veranda. The latter was the flat surface on the (illegally constructed) concrete roof above the rat room. It was surrounded by (illegally constructed) concrete blocks which have now gone. We did meet a snake there on our second visit to the hovel hence the name. It was where i killed an adder a few weeks ago. 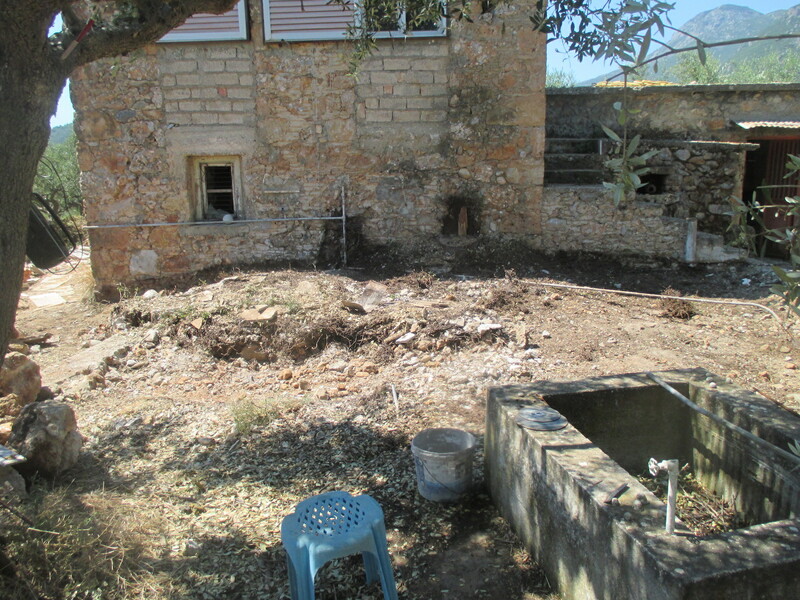 In time there will be a new patio there with a wooden construct above it on which a vine will be trailed. Our patio will be made of rough local stones so it will not be even but it will be in keeping with a 100 year old property. In the shade of the vine I will put up a large wooden table for lunch. Also disappearing is the stairway up to the front door. In my old unhealthy days I used to sit on those steps enjoying a cigarette and the complete calm and quiet. I rather liked the steps. They too were topped with concrete but it was so old and weathered that it almost blended in. 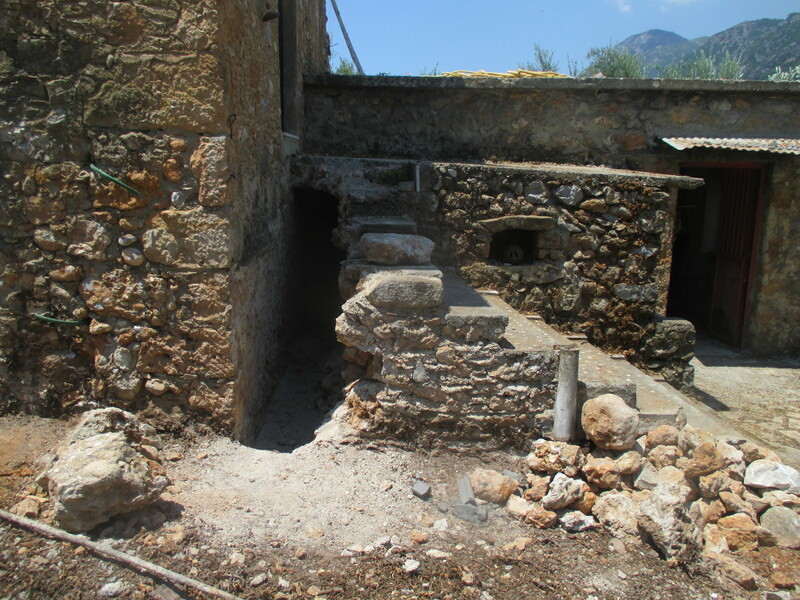 But the steps have had to be partially removed to allow the injection of concrete into the main structure to ensure that it meets the standards required to withstand earthquakes. They happen in this region every few decades and so it seems a sensible enough move. If you look inside the hole created you can see the old stone-work of the main house which really is very attractive. 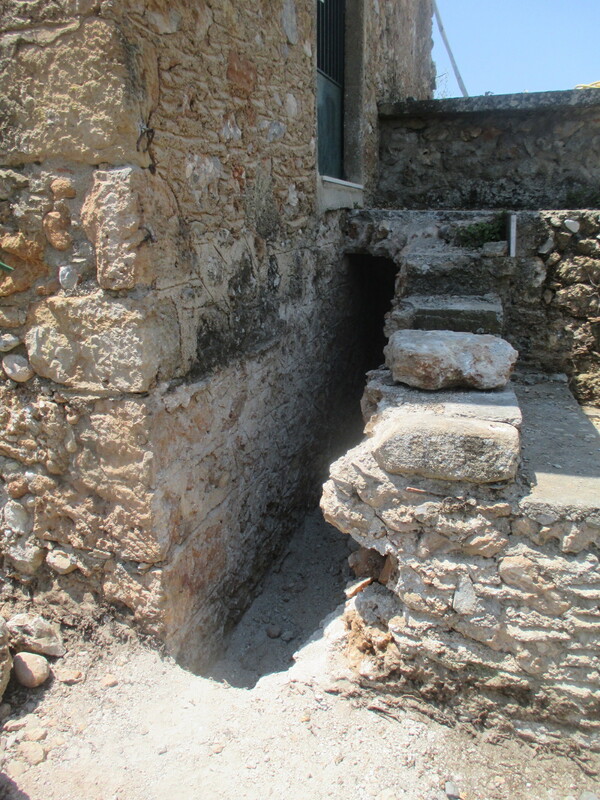 The new stairs will be built of the same stone with no concrete topping. 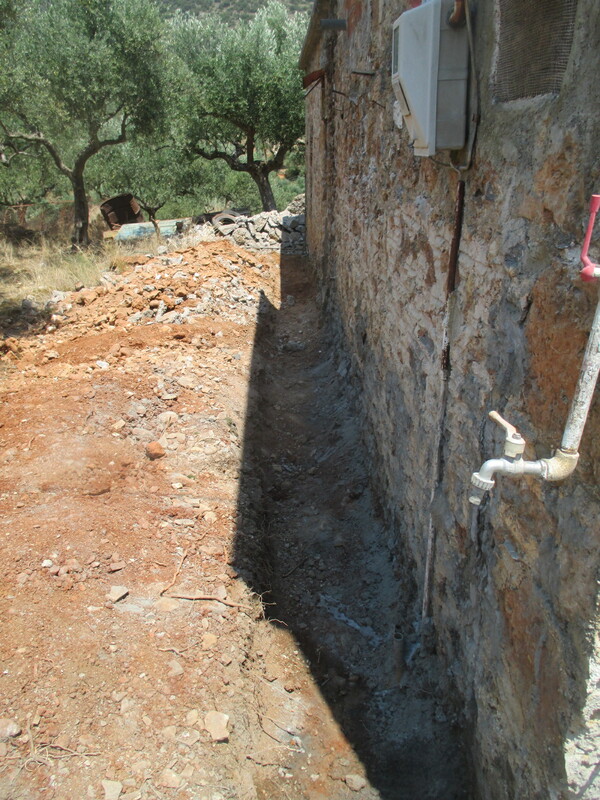 The Greek Albanian team of workmen have dug all around the house to expose more original stone and allow the concrete injection. This shot is of the back of the house. For now this is an external wall. But the intent is to add a whole new wing along this side of the house, doubling the overall floor space and making this wall an internal one.